Have you ever wanted to build a change management process in Zendesk and not known where to start? 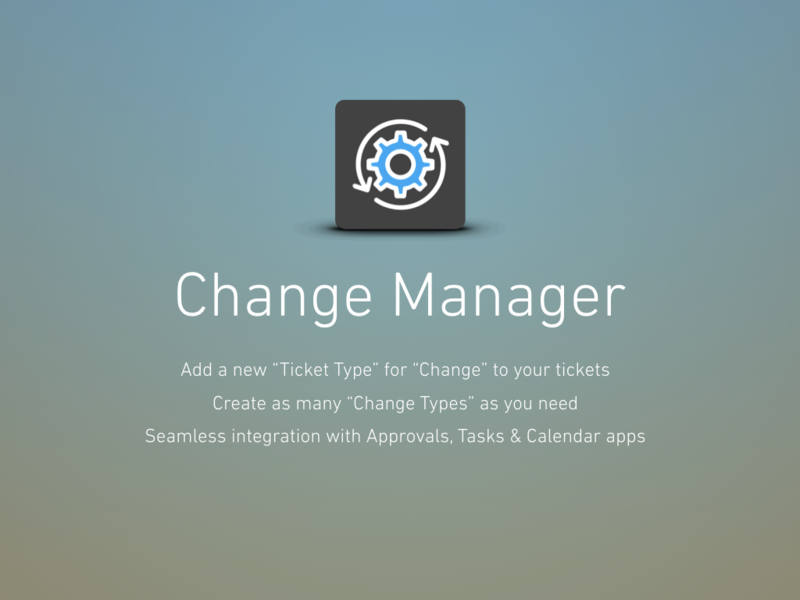 This app will create all the common change management ticket fields for you, including adding an extra ticket type "Change", to go with the other 4 system types (question, incident, problem & task). It enables you to define which ticket fields should be shown depending on the type of change(s) you've created in the app's settings. For each change type, you're also able to provide a link to documentation defining the process that needs to be followed to complete the change (ie. the change model). Additionally, this app is designed to work seamlessly with other SweetHawk apps such as Approvals, Tasks & Calendar to help nail every element that you require for your change management processes. 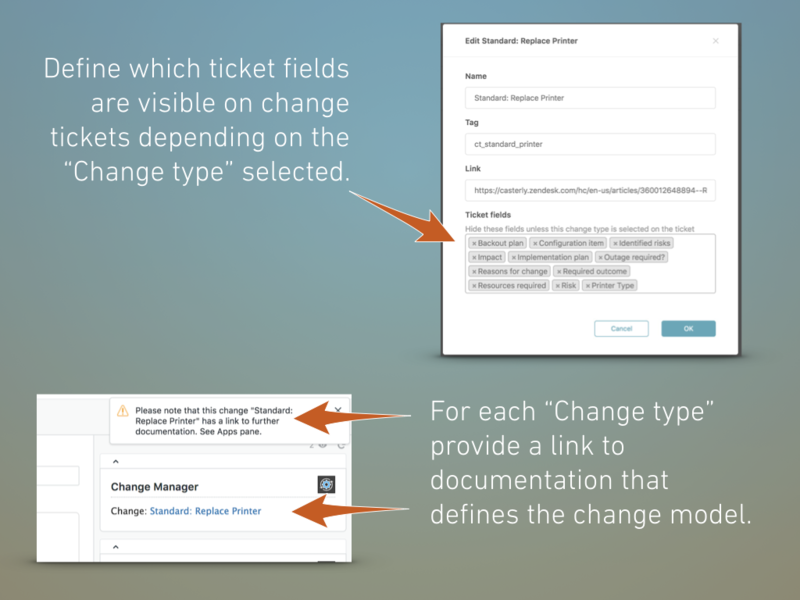 The change manager app is designed to make it much easier to setup change ticket flows in Zendesk by adding a new change type and conditionality to your ticket fields. 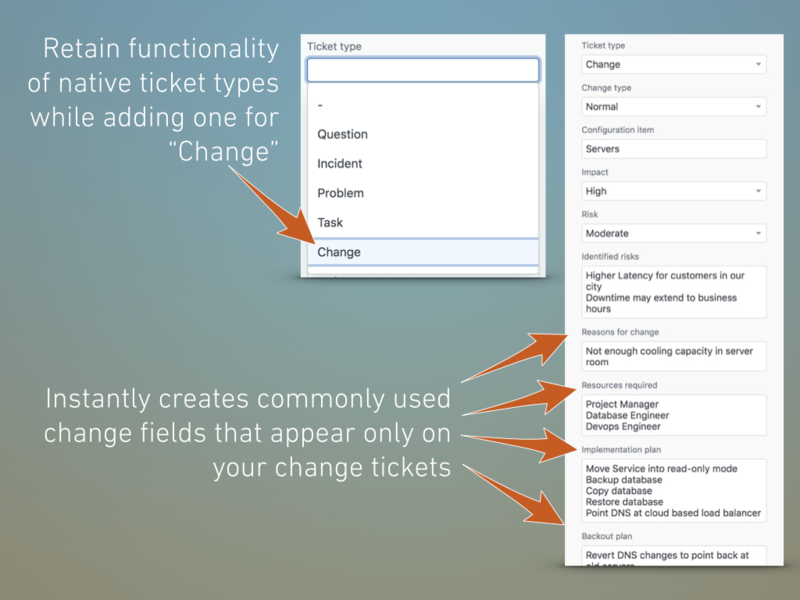 The way it works is that when you open the "Type" dropdown on a ticket, you can see "Change" is now an addition to the previously existing 4 system types, Question, Incident, Problem, and Task. Note that these types will still retain their native Zendesk functionality, for example, if you click on Incident, you'll still need to link it to a problem. But, when you select change, it will ask you to select a change type. By default, there's Normal or Emergency, but, you can add as many change types as you need. For now, we'll select ‘Normal’ and you can see a series of fields then appears to help you categorize what the change is for, the impact, the risks, resources required ...and other fairly common fields you might expect to see with a change. Note that all these fields that just appeared are created by the app at the point that it's installed, and in the app settings you can define which of these fields you want to use for each change type. So let's jump over and see how to create one. For an example, let's say our new change type is around how to go about replacing a printer. We click on the admin panel on the left, and click on “Add change Type”. Add in a tag associated with the change. Then specify a link. This link should be to documentation that outlines the process model for an agent to be able to implement this specific change. So, in this case, they can’t just go and buy a printer from down the road, they need to get it from a specific supplier and choose from a predefined set of models as defined in the documentation. Finally, we get to specify the Zendesk ticket fields that will automatically appear when this change type is selected. As you can see, all of the default change fields are added (like we saw in the Normal change), but if some of these don’t apply for this case, we can just remove them by clicking the X. Conversely if you have other Zendesk custom fields that you want to add to this process, you can do that too. For example, you may want to add a “Printer type” field. And that’s it. Now, let's test it out. Create a new ticket, select “Change”, then select the new "Replace Printer" change type. Since this change type has a predefined process that we added a link to, at the top right we can see a popup notification letting us know, and it's also listed in the app on the right too. Then it’s simply a matter of filling in the rest of the change details and following the process outlined in the link. And that is how the change manager app works. But, here’s where it gets interesting; because there’s a lot of directions any given change could go from here. Maybe it needs to be scheduled on a change calendar. Maybe it needs to be sent for approval or you might even need to assign tasks to others to implement it. 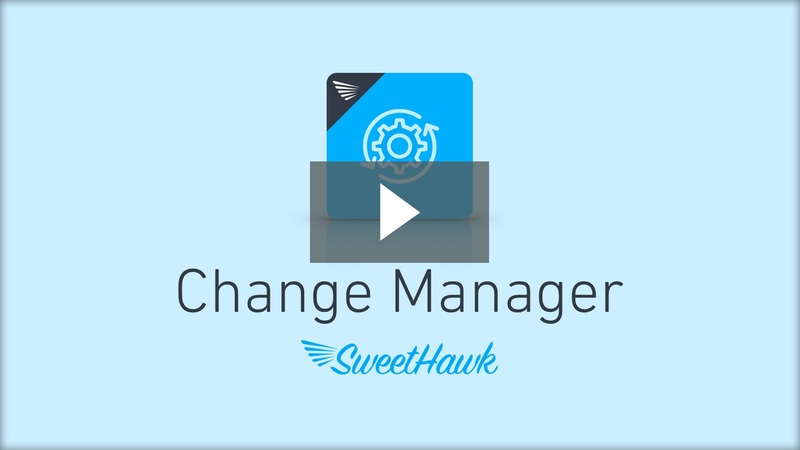 For this, SweetHawk provides a series of other apps; Approvals, Calendar & Tasks; designed to work in unison with this change manager app to help nail every element that you require for your change management process.